It is generally advised that all goats be vaccinated against overeating disease (enteroxemia) and tetanus. Both of these diseases are caused by clostridial bacteria present in animals and the environment. 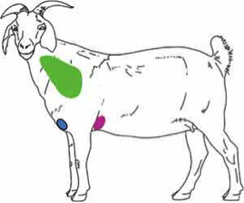 Goats kept on marginal pastures and/or not fed grain may be at much lower risk for overeating disease, but they are susceptible to tetanus. Vaccines used for these diseases usually provide protection for both diseases. 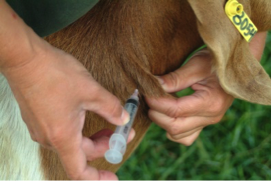 These combination vaccines simplify herd preventive health programs and decrease costs. What is overeating disease (enterotoxemia)? Overeating disease is also known as enterotoxemia. It is an acute and often fatal disease affecting goats of all ages. The disease tends to be more deadly in young kids, and often in those which are the heaviest or fastest gaining. Overeating disease is caused by the bacteria Clostridium perfringens types C and D. These bacteria are commonly found in the soil, and are also present in the intestines of most normal goats. The deadly action of these clostridial bacterial organisms is related to the bacteria’s ability to produce toxins which cause shock and nervous symptoms (type D), or that cause inflammation of the lining of the gut and diarrhea with blood (type C). Under appropriate conditions, the clostridial bacteria in the gut rapidly grow to high levels and produce and release their deadly toxins. Most conditions favoring clostridial bacterial growth are related to access to a grain or “rich” feed, especially when the animal is not accustomed to the feed. Sudden access to grain or a richer diet or any dietary changes, especially to a “richer” diet, favors clostridial bacterial growth in the intestines. Changes in feeding programs must be gradual, with a week or two or more allowed for a change from one type of feed to another. It is also important to avoid over-consumption by kids, for example, after they have become excessively hungry. What are the symptoms of overeating disease? There are many different signs associated with overeating disease. Goats can be found dead. Other signs include being down and/or having neurological signs. These can include twitching, star gazing, teeth grinding, fever, swollen stomach, diarrhea with blood, convulsions, and death within a few hours. Tetanus is a neurological disease caused by a toxin which is produced by the bacterium Clostridium tetani. This organism is very common in soil and in the manure of animals. Bacterial spores enter the body through wounds following castration, ear tagging, disbudding, kidding, etc., resulting in signs of the disease 4 to 21 days later. The toxin affects the central nervous system. Signs include stiff muscles, spasms, flared nostrils, erect/stiff ears and elevated tail. In addition, the affected animals have a difficult time opening their mouths, so the term “lockjaw” has been given to the disease. Animals can be hyper-responsive to stimuli. Eventually, the affected animals can go down and die. What vaccine should be used? There are several vaccines available for clostridial disease. A product labeled for goats is recommended. In case of any problems, you are always in a better position if the product is labeled for your specific use. C-D-T or 3-way vaccines: Clostridium perfringens Types C and D +Tetanus Toxoid in one vaccine. Choose one labeled for goats. One example of a multivalent product is Covexin 8, which has a sheep label. This product protects the animal for clostridial diseases other than enterotoxemia and tetanus. Although blackleg and malignant edema are common and costly infections in sheep and cattle, they are uncommon in goats. Producers sometimes have reported more adverse reactions with the use of a product like this. A multivalent product may be preferable in herds which have had problems with other clostridial diseases such as blackleg and malignant edema (gas gangrene). What dosage should be used and when should goats be vaccinated? Use the product as it is recommended on the instructions provided with the vaccine. Dosage: read and follow the label instructions as dosage differ slightly between manufacturers. Breeding females. 4 to 6 weeks before kidding. By vaccinating does in late pregnancy, some immunity will be passed on to the kids through the colostrum. Kids. Follow vaccine label instructions for timing and dosage, as both differ slightly between manufacturers. If breeding females have been vaccinated before kidding, a common practice is to vaccinate kids at 8 weeks of age, followed by a booster 21 to 28 days later. If breeding females have not been vaccinated before kidding and you experience problems, it is a common practice to vaccinate kids at 2 weeks of age, followed by a booster 21 to 28 days later. Breeding females. Vaccination should be scheduled so that pregnant does receive their second vaccination or annual booster 2 to 6 weeks before kidding. By vaccinating does in late pregnancy, some immunity will be passed on to the kids through the colostrum. If breeding females have been vaccinated before kidding, it is a common practice to vaccinate kids at 10 to 12 weeks of age, followed by a booster at 16 to 18 weeks of age. If breeding females have not been vaccinated before kidding and you experience problems, it is a common practice to vaccinate kids at 4 weeks of age, followed by a booster at 10 weeks of age. How should injections be given, and where? 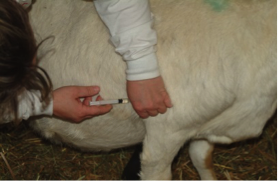 Both Clostridium perfringens Types C D /Tetanus and multivalent clostridial vaccines are given by sub-cutaneous or intramuscular injections. Sub-cutaneous injections are favored because of the greater tissue damage at the injection site from intramuscular injections. For sub-cutaneous injections, pinch loose skin between thumb and index finger high on the neck (as close to the head as possible) or behind the front leg (“armpit” or axilla), or between the chest and one of the front legs (Figure 1), and insert the needle. Make sure that the needle is under the skin and does not stick out on the other side of the pinched skin. How should I handle and store the vaccine? Store out of direct sunlight at 35-45°F. Insert a clean needle into the bottle when first opened, and aspirate vaccine only from the inserted needle so as not to contaminate the vaccine remaining in the bottle. It is recommended to use the entire contents when the bottle is first opened. Is there a slaughter withdrawal time? Read and follow label directions. But, yes, there is usually a 21 day waiting period between vaccination and slaughter/sacrifice for these vaccines. A sickness in one goat or in the whole herd can cost much more when sick animals have to be treated compared to the cost of prevention. Some health problems cannot even be treated. Thus, prevention is the only sensible approach to goat herd disease management.